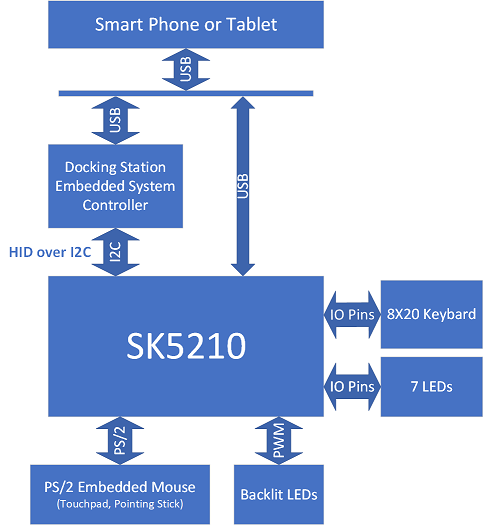 The SK5210 is a low power USB and I2C dual interface keyboard encoder with 1 PWM backlight and 7 LEDs control. While the USB interface is connected to the main PC as normal keyboard, the secondary I2C interface can be used to communicate with a system embedded controller (EC) for EC to receive all user events and get full control of the system. It’s the best choice for customized keyboard design for tablet / PC / laptop / docking station / Instrument. The SK5210 scans and encodes an 8-row by 20-column matrix. The key press events are translated to keyboard report. The encoder gets matrix information from on-chip matrix tables. The backlight LED PWM brightness control and 7 LEDs can be controlled via the dual interfaces by commands or key press events. The SK5210 provides an external PS/2 port that supports hot plug and hot swap of PS/2 devices such as touchpad, pointing stick, mouse including wheel mice, and keyboard. The host can send commands via SK5210 PS/2 command relay feature to the external PS/2 device to change default settings. The software is used to generate configuration data (keyboard matrix, macro key definition, scan code definition and other feature control parameters) into a binary file. The software is used to download configuration data to keyboard controller. The software is used to test all Sprintek USB and PS/2 keyboard products.